We’ve been eating so many vegetables lately. We always have but the last few months, I decided to challenge myself to just add more and more so that each meal is packed with vitamins and nutrients. I want to really see a difference in how I feel because of what I am eating- but I still want eating to be fun. This can sometimes be a bit of a challenge in the winter when not as much good local produce is available but I’ve really enjoyed the winter veggies I have found- especially those root veggies! This first salad is so colorful and it is all raw and made me feel so good. 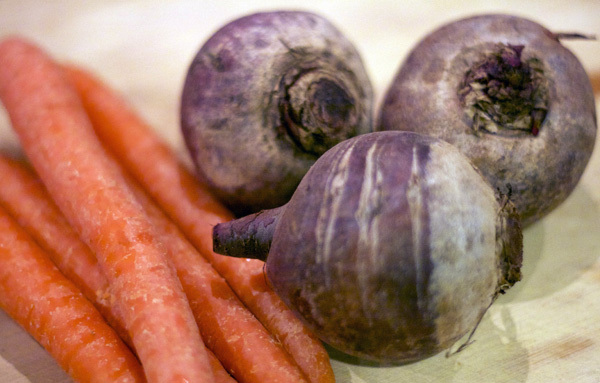 Place the carrots and beets in a big bowl. Mix all the other ingredients together in a blender or food processor. Pour the vinaigrette over the beets and carrots and stir. 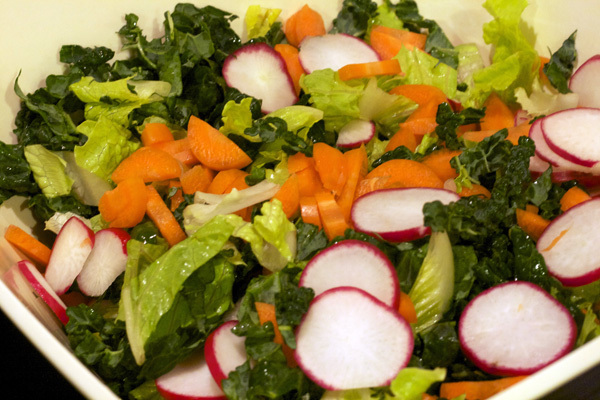 This next salad has been a favorite of ours the last couple weeks. I got the idea from our dear friend Ali Marie, half of the super couple behind Dolan Geiman Art. I write for their blog once a month and in between blog posts and real life visits, we share recipe ideas. I altered it a bit just simply based on what we had in our kitchen. She likes to use spinach and add green onions to hers and uses a ginger vinaigrette on top. I added kale, garlic, lemon, and parsley all of which we eat a ton of. I decided to call it a chop salad sort of mockingly. I have always thought the name “chop salad” was funny and when I was a cheese monger back in Seattle, I had to also slice deli meat. Older wealthy women would come in and tell me they were making a “chop salad” and as they said those words, they all seemed to make a chopping motion with their hand. But since this salad does require lots of fine chopping, it seemed an appropriate name. The mint gives it a refreshing feel and a hint of Spring. It is so tasty! Mix all the vegetables together in a big bowl. Season with salt and pepper and squeeze the lemon over. Toss. Add the almonds and cheese. Enjoy! Speaking of Dolan Geiman’s blog, this next recipe originally appeared here (along with some other one-pot meals) a few weeks ago but I’ve made it about three times since so I thought I should share it here as well. I sometimes grocery shop for a woman in our neighborhood who isn’t able to get out much. One day she needed some lima beans and explained how she was going to prepare them which gave me the basic idea for this next soup recipe. I added the lemon and herbs. It is so very simple to make and quite delicious. In a Dutch oven or soup pot, cook the bacon pieces on medium heat until almost done. Add the onion and stir. Cook until the onion is soft. Add the lemon juice and herbs, stirring to mix well. Add the beans and stir well. Cook for a few minutes and then add the stock and bring to a boil. Lower heat to a simmer for about 15 minutes. Season with salt and pepper. Preheat oven to 475. Layer the potatoes, onions, thyme, salt, pepper and then place tiny pats of butter on top. Repeat layering until you have filled the dish with several layers. Pour the broth in and bake in the oven for 20 minutes. 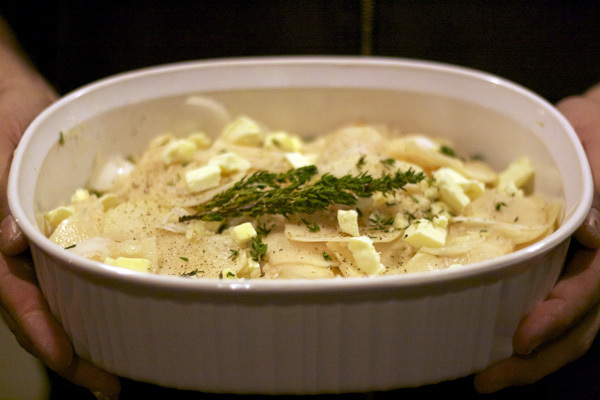 Remove from oven and top with cheese and a sprig of thyme. Place in the oven and cook for 15-20 minutes more until top is brown and most of the liquid has been absorbed. I wanted to make a big pot of yummy, comforting Risotto one evening recently but I was more in an Asian food mood. I sort of hate the word “fusion” and most implications associated with it but loved the idea of this end result. So as to not conjure up ideas of restaurants with “fusion” concepts on their menu, I didn’t call this a risotto but that is in fact how I prepared this dish, just as I would have a classic risotto. It was really delicious served on top of some steamed asparagus with a little squeeze of lemon on top and a piece of Coho Salmon that had been marinated in nama shoyu (or tamari or soy sauce) and brown rice vinegar. It made for quite a colorful meal. First, make sure to do all the prep work necessary for the rest of the meal as you will need to stir for quite a long time to pull this dish off. Place the stock, coconut milk, red curry, chili paste, vinegar, and fish sauce in a pan. Heat on medium heat and then simmer. Heat a large pan or Dutch Oven on medium heat. Add the oil. Add the onion and cook for a few minutes, until it begins to soften. Add the garlic and pepper and stir. Add the rice and stir. Add the wine and stir. Gradually begin to add stock in, about half a cup at a time and continue to stir. Stir until most of the liquid is absorbed. Add another addition of stock and stir until most of the liquid is absorbed. Repeat this process until the mixture is creamy and a bit loose; the rice should still have some chew to it. The process will take about 20-30 minutes. Right when you think you are getting close, add the tomatoes, half of the cilantro (save the other half to sprinkle over the plate before serving), and the salt and pepper. Stir. Let sit for a few minutes and then serve. This recipe made a huge pot of rice. We had enough leftovers for at least 2 more dinners later in the week. 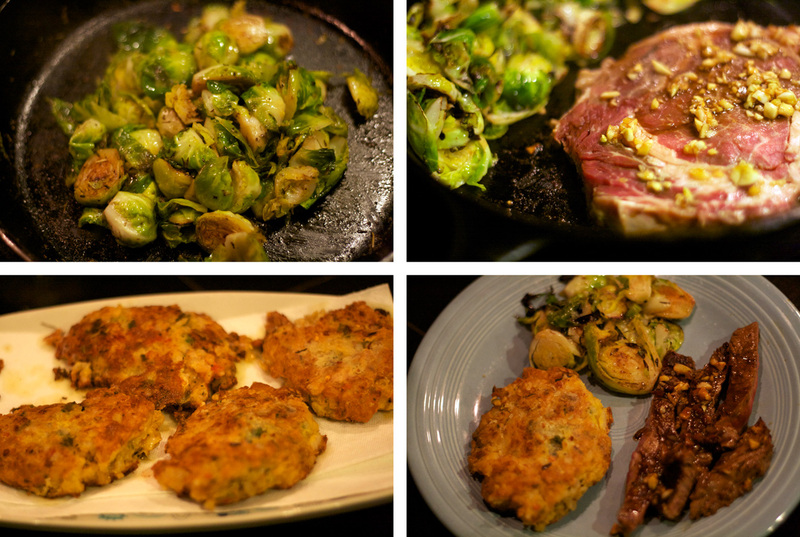 One night we made rice cakes, sauteed Brussels sprouts and iron skillet steak. 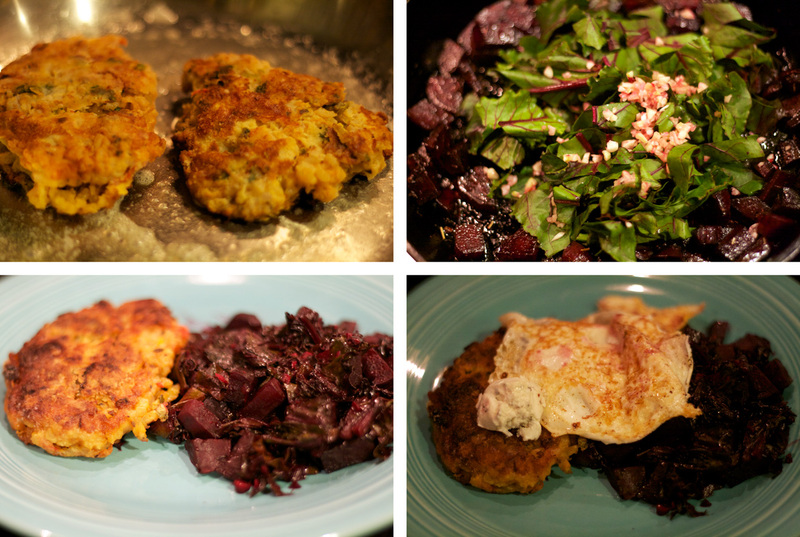 The second time, we enjoyed rice cakes again but with beets cooked with the greens and a soft fried egg on top. Despite the Asian flavors, it had a nice Mediterranean feel to it. Yum, yum, and yum! Oh, and while we’re talking about fish, I ended up making homemade fish sticks by accident, sort of. We decided that since we cook fancy and fun meals all year long, for Valentine’s Day, we would not not do what everyone else was doing and instead we would not cook. 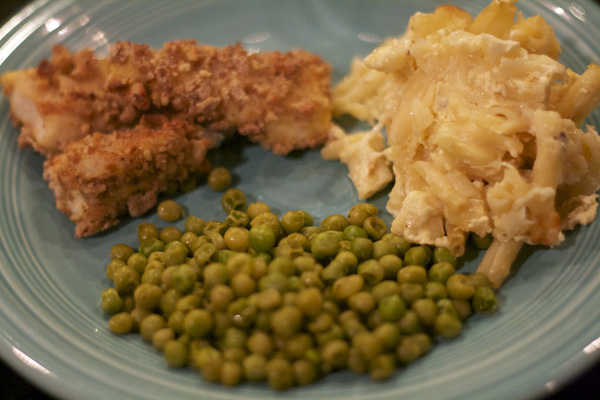 We would revert to one of both of our childhood comfort meals- fish sticks! Ha. I was going to buy the healthier version but decided not to worry about it and go get Grant’s favorite brand, Van de Kamp’s. Apparently, these are not available in our neighborhood Kroger. So, I spent nearly 45 minutes looking for them. I finally tried to settle for one of the other brands but made the mistake of reading their ingredients. Agh! I just couldn’t buy them, especially to celebrate a holiday about love. So, neurotic as I am, I then scurried through the store and found TN farm-raised catfish and came home and spent the rest of the “relaxing” evening making homemade fishsticks! They looked more like catfish “fingers” but this brought to mind images from Okie Noodling so I decided to just call them fish sticks. Preheat oven to 400 degrees. Place the flour in one bowl and mix with the seasonings. Place the beaten eggs in another bowl. Place the bread crumbs in a third bowl. Dip each fish strip in the flour, then the egg, and then the breadcrumbs. Next, place the fish strips on a well-buttered baking sheet. Bake for 10 to 15 minutes, flipping them over halfway through. Homemade Catfish Sticks, Macaroni & Cheese, and Peas. February was filled with a little too much sugar as talented friends baked sweet confections to celebrate Mardi Gras. And then I got addicted to this wonderful recipe for Sorghum Graham Cookies that my pastry chef friend, Rebekah, shared with me for a December blog post. 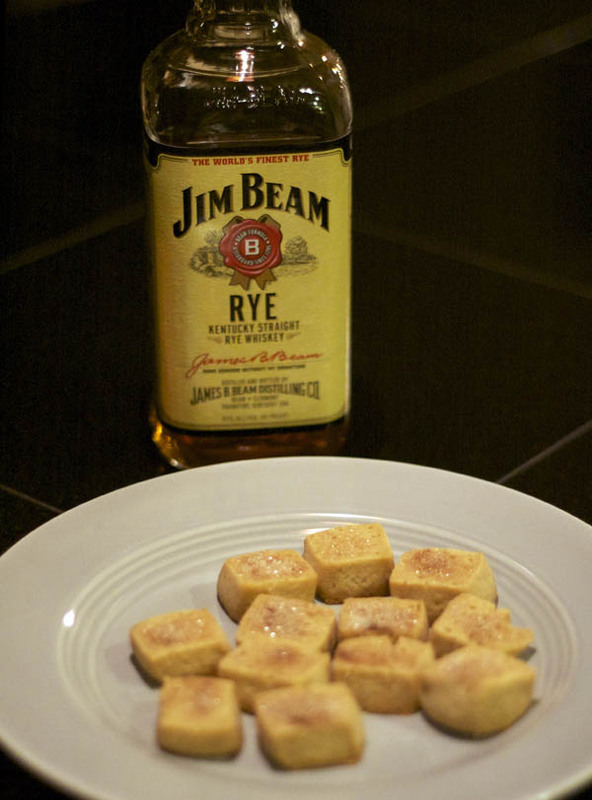 They are amazing with this delicious Jim Beam Rye. And I’ll end this post with a musical recommendation- Canadian Daniel Romano. He came through Nashville last week and jump started my musical outings. They’d been a little sparse lately but not because there wasn’t any to go see. I feel like a turtle who has just decided to poke my head out of my shell. Definitely catch his show if he comes through your town. He has crafted some really clever songs and is quite a fancy dresser to boot! OK, this post has made me HOUNGRY! I bought some beets just the other day and wanted to make some sort of salad with them. I love beets, but mine didn’t turn out as yummy as yours looks. So I’ll try yours next time. And the fish “sticks” look like something I could start eating, but would have a tough time stopping. Woo-hoo! So many good eats! Sorghum graham cookies?! Dang! Oh, I am going to make you some soon! Hooray! Get down here Missy!